It’s amazing to think back and whenever he lines up on those tight angles, I don’t get stressed out at all, he just gives you confidence he will kick the goal every time. I haven’t felt that sure about an EFC player kicking goals from anywhere for a long time. I think this is our biggest since Carlisle kicked 8 against the Bulldogs in 2014. Has kicked 11 goals 1 behind from set shots this year. 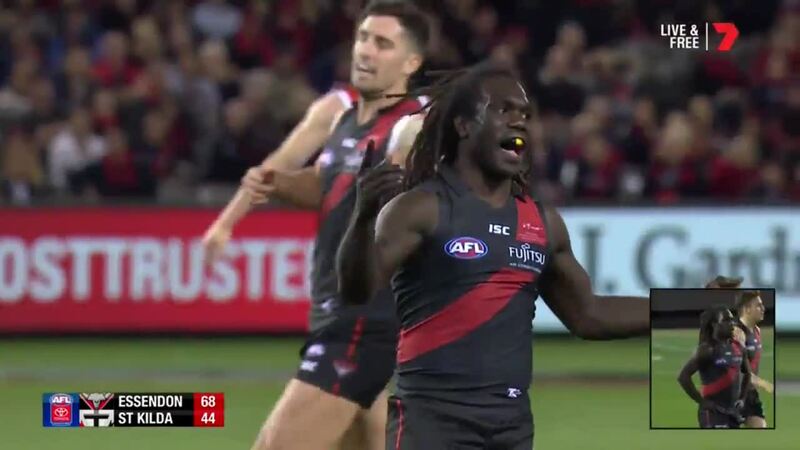 Walla’s leading patterns were superb today. Thanks. That a good get. Haha, I actually did that exact Banderas move when he kicked his 6th and 7th. Just bliss. why do we not have collars as part of our regular kit? Wonder how much better Mozzie will end up for having come up in Walla’s wake. Really pleased for him - has worked incredibly hard. It’s so refreshing seeing him take a mark inside 50. There is none of that ‘will he kick it’ nervousness. I’d be keen to know his on the run accuracy too. When Walla has space to work in he is dominant. They couldn’t get near him today. Every time Walla or Ridley have it I feel very comfortable. The 2nd last goal he kicked just shows how nervous he makes defenders. Defender had a bit of space, fumbles the ball and then goes to ground. He was so worried about tippa closing him down he forgot to concentrate on the ball. Someone once mentioned in a training report that Tippa does 6 impossible things before breakfast and this is the best way to describe him, yet there was no magic dances, pocket over the shoulder kicks, roved taps or candy selling today, this was pure skillful football executed at it’s best, such a display of all round football talent, intelligence and skill execution. Could have easily had 8. Tippa smashing his way through to kicks goals. A few Brownlow votes coming up for Tippa this year if he can stay on course. Great job and he’s earned it the hard way. Very satisfying I would think for Tippa and his families both in Melbourne and the Tiwi Islands. Can everyone just take a second to think what watching Mozzie and Tippa win a bag of premierships over the next decade will do for the boys up in the islands up north. Great for footy, great for them, great for us. Tippa may have a long role at the EFC as a den mother. He’s very dangerous when he is running to space in the forward line. Either to mark or to a loose ball. Today his set shot kicking was just stupidly good. Sure he practices this stuff, but still it was very very good. The type of good that when opposition players have done it to us we scream they are getting goals out of their arses. Finally we get to enjoy it too.